One of the real pleasures of 2013 for me was having Grand Master of Photography Peter Eastway co-lead the Jewels of the Arctic expedition last August to Greenland and Svalbard. Peter is one of the most accomplished, awarded and respected landscape photographers working today and it was fantastic to be able to work with him during this expedition. On top of being a landscape photographer Peter is also owner and editor of Australia’s Better Photography Magazine. He recently documented our journey through the Arctic for the Summer 2014 issue and has generously allowed me to release the article here as a PDF for download. Be sure to visit Better Photography and subscribe for future articles and issues. Just in case you missed it – Be sure to watch the short film produced by my good friends at Untitled Film Works of our experiences in the Arctic. Make sure you watch it full screen in glorious 1080p High Definition! 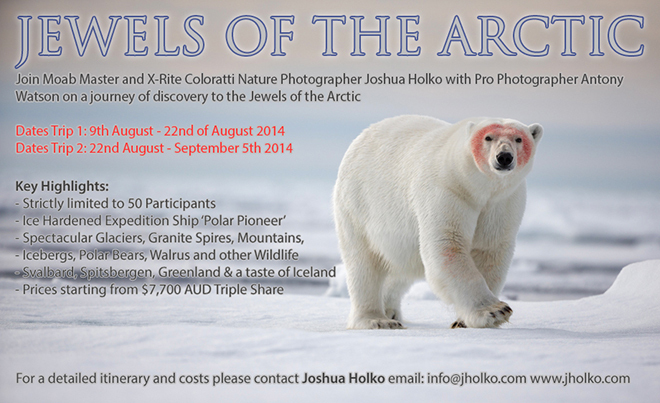 For those of you who have already enquired about the expedition I will be leading in July 2015 to Photograph Polar Bears I will be opening bookings in the next few days. This expedition will be limited to just twelve photographers and there are preliminary details on my website in the WORKSHOPS section.